This practical reference focuses on 28 of the most exciting developments in manufacturing processes and materials. Through in-depth discussions, Modern Manufacturing Processes explains what the new processes are and covers the advantages of each. Additionally, it will help you decide whether these processes are a viable alternative to what you are currently using. 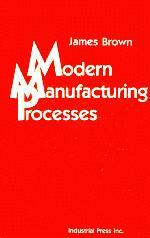 Compares non-traditional and common manufacturing processes. Investigates competitive costs and explains how a non-traditional process can offer big savings. Illustrates how each process is used in industry. Metal Injection Molding. Aluminum Brazing. Hardcoating. Titanium Nitride Coating. Poly-OND. Electrolyzing. Powder Coating. Electroforming. Electric Discharge Machining. Abrasive Waterjet Cutting. Magneforming. Fineblanking. Cold Forging by Coining. Hydroforming. Metal Spinning. Shearforming. Orbital Cold Forging. Roll Forming. Thermal Energy Deburring. Abrasive Flow Machining. Electrochemical Deburring. Electrochemical Machining. Computer Integrated Manufacturing. Advanced Composites. Ultrasonics. Hot Isostatic Pressing. Honing, Lapping, Polishing. Ceramics.